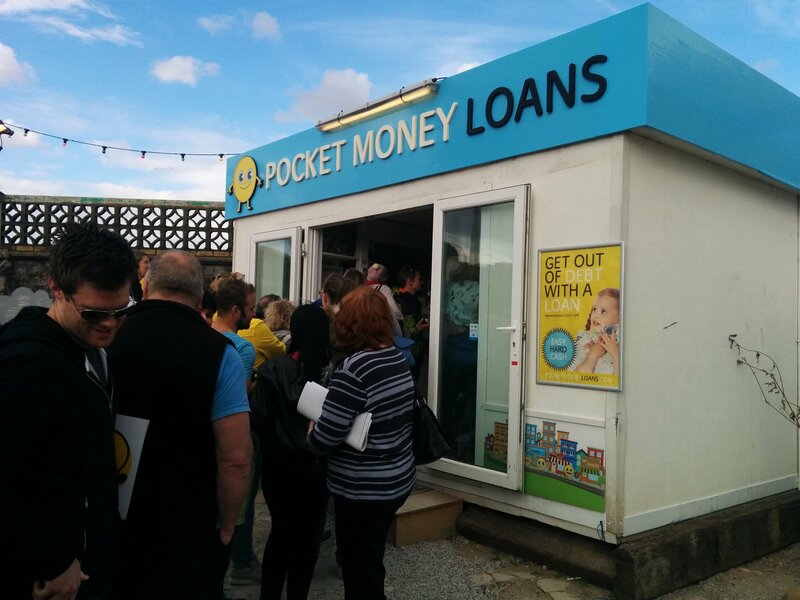 London Baby On Tour – Your last chance to visit Dismaland! | That's London Baby! 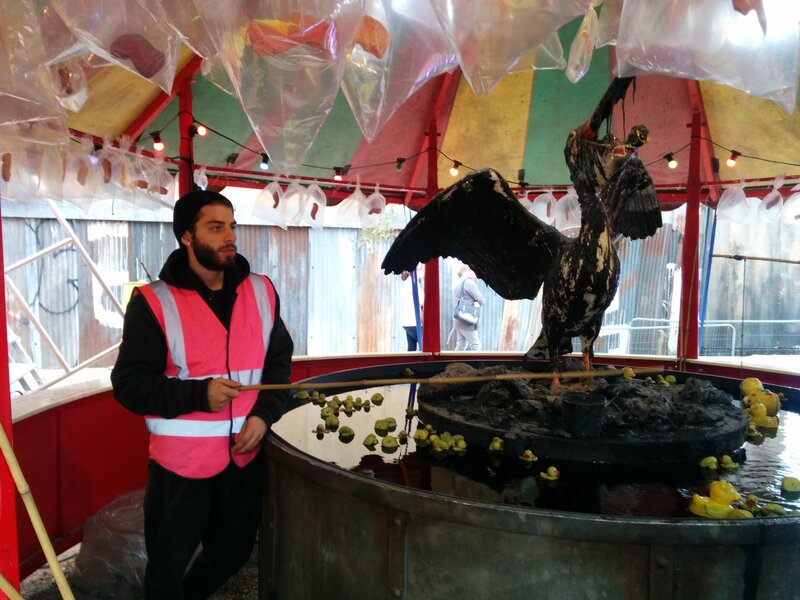 London Baby On Tour – Your last chance to visit Dismaland! 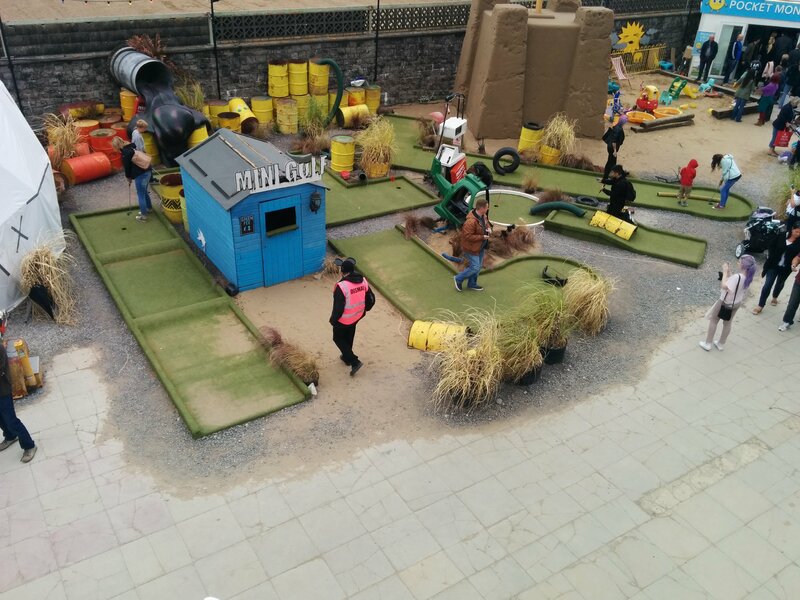 London Baby has been out and about quite a lot recently and so I invite you to read about one of my day trips – to Weston-super-Mare (near Bristol!). 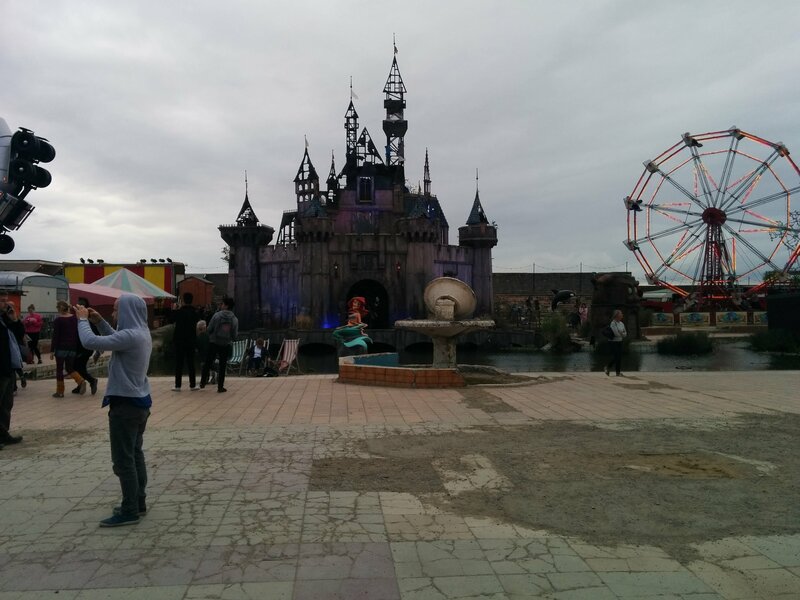 Dismaland has been the talk of the town in London, certainly for art lovers, hipsters, and people who usually don’t care about culture. When I was there, it seemed that every second person came visiting from London! So I thought that this definitely warrants the first “London Baby Day Trip” post on this blog – certainly if you have been doubting whether to go, you have less than a week left before it closes its doors forever on September 27th. 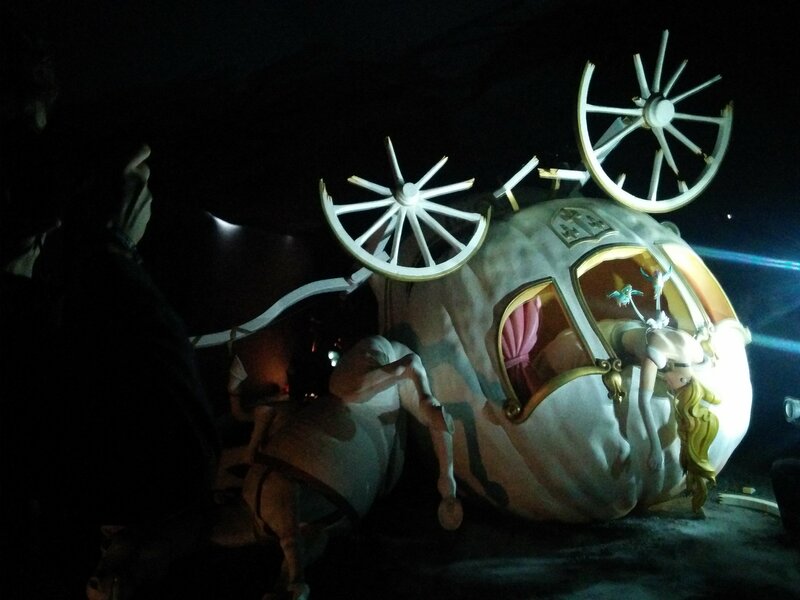 “Dismaland” – a “Bemusement Park” is the brainchild of Banksy, one of the world’s most famous street artists.At the outset, its an art show, but a little bit differently presented than in your average museum. 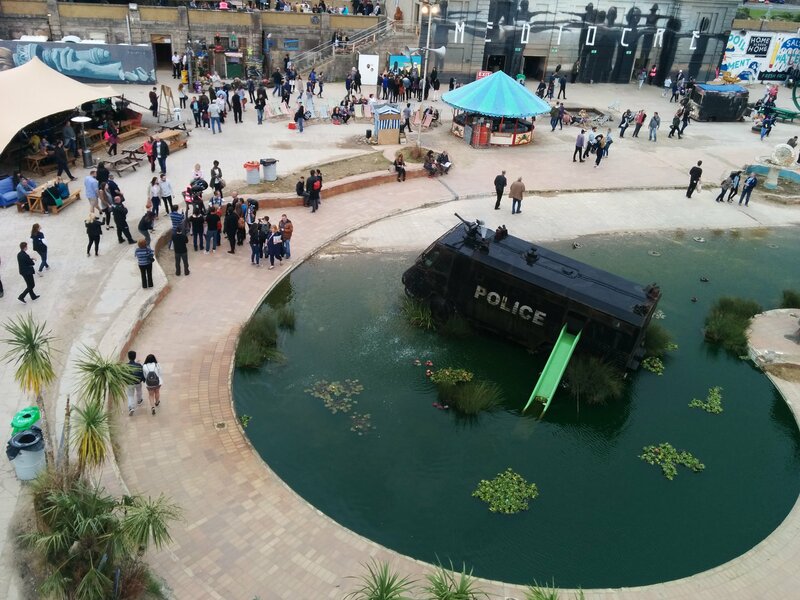 Dismaland features art (installations) from more than 60 artists – among them famous names like Damian Hirst and Banksy himself, but also many more from UK, US, Germany, the Middle East and others. A full list of artists can be found here. 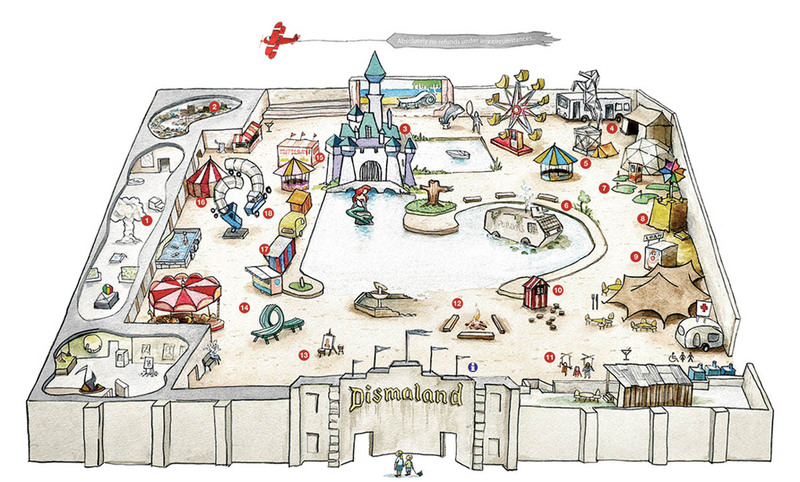 The setup is a Theme Park and the borders between a theme / amusement park (or the satire of one) and an art exhibit are grey and almost none-existent. 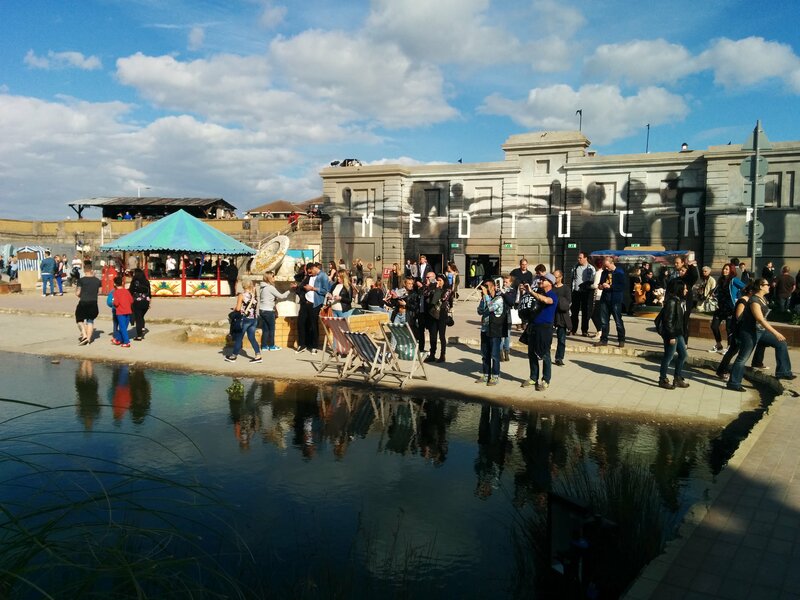 There are (quirky) rides, activities, but also loads of open air sculpture, exhibition space and an open air cinema with short art films, as well as a bar and a tent with food. 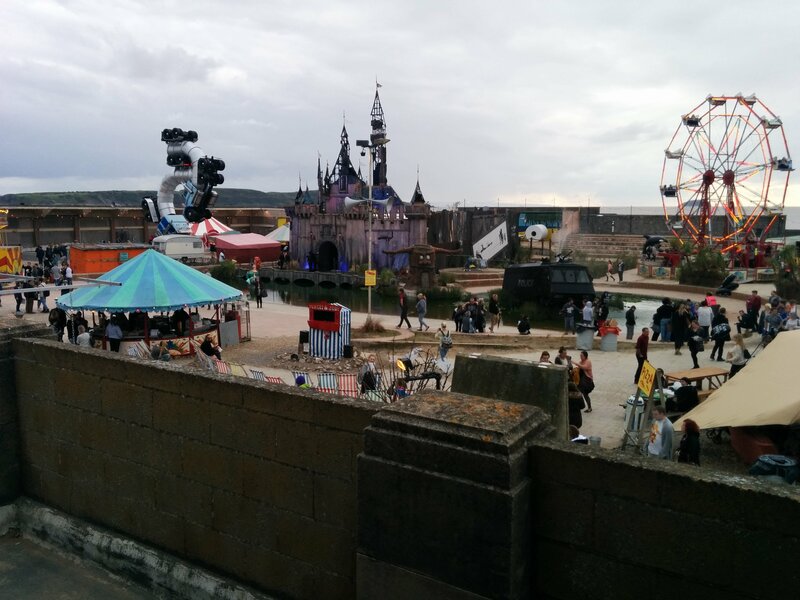 As indicated above, there is definitely a lot to see in Dismaland, namely art. There are dedicated exhibition spaces on the left hand side of the park, as well as several “tents” (refugee camp, circus tents etc.) with further art exhibitions. Furthermore, there are quite a few open air sculptures and an open air cinema showing selected short films. 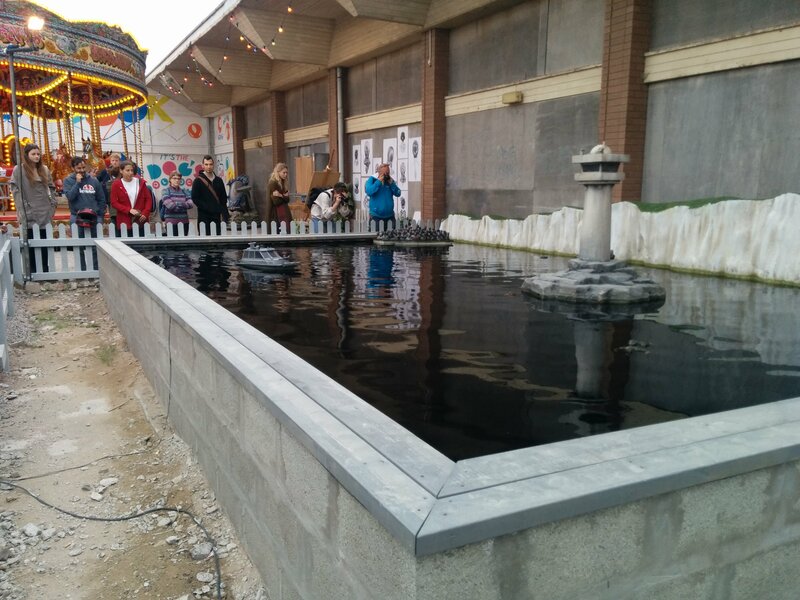 ….and typical theme park activities, such as Mini-“Gulf”, “Topple the Anvil”, “Steer a refugee boat/ a cost guard boat”. Last but not least there is a tent with Street Food and a bar. 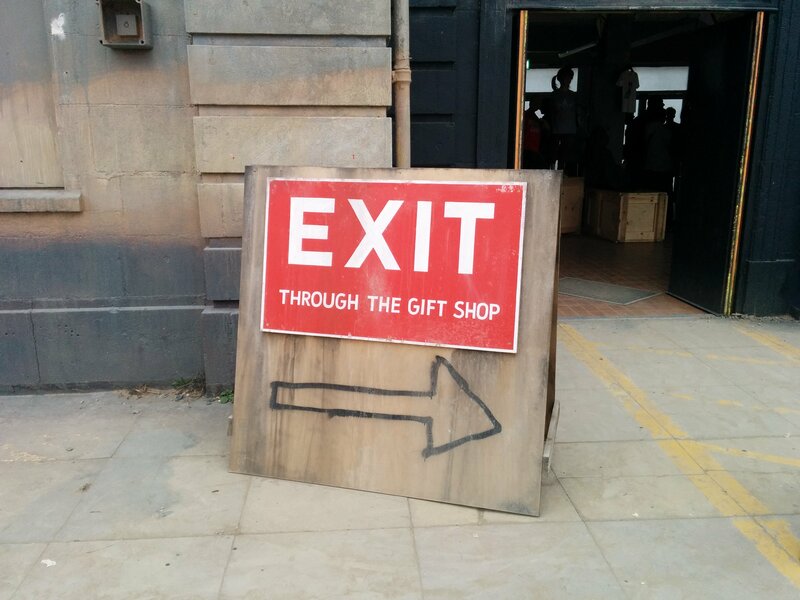 And…in true Banksy style, there is the “Exit Through the Gift Shop”. A genuine highlight that I did not want to forget to mention, is people watching (from the very arty crowd seeking the meaning of all this, to the local population who sort of knows that this is not for real but if its not real, what is it then….To the people who find all of this a massive sell-out…) AND watching / photographing / trying to interact with the Dismaland staff. They are amazing, making children cry, insulting visitors or plainly being bored to non-caring. How much does it cost? And how about tickets? Entry to the park is 3£. In the park you can spend more money (e.g. 5£ for a very large and detailed programme/catalogue, 5£ for pictures/balloons, 1-2£ for some rides and attractions, as well as at the Food / Drink tent and bar (prices slightly below typical London Street Food prices). 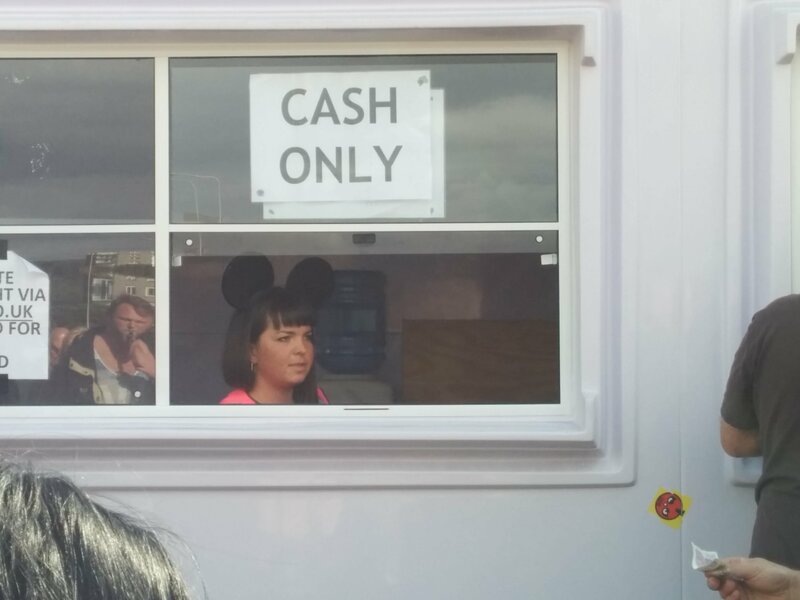 As the motivation of employees in Dismaland is ….dismal….there is no pushing whatsoever, so you can decide if you want to spend that extra money. the All exhibitions within the park itself are for free. Tickets is another matter altogether – online tickets that guarantee entry at a time slot have now sold out. 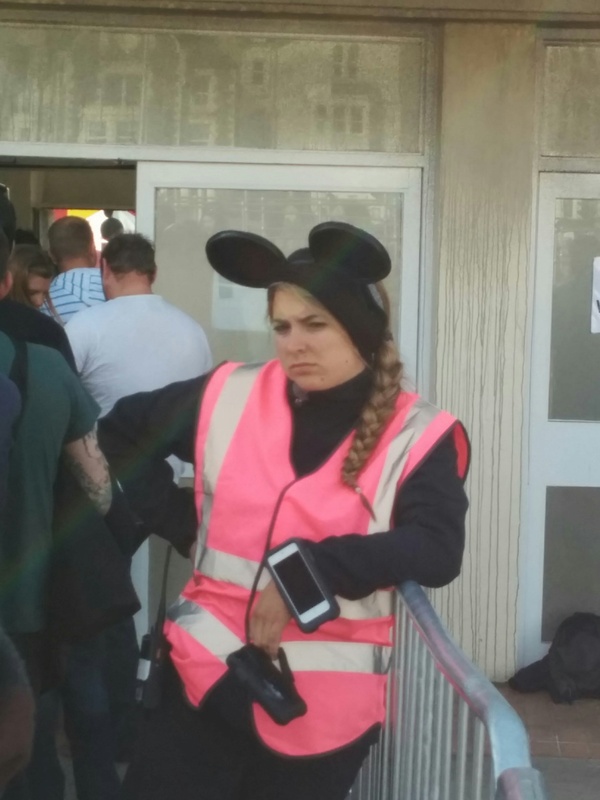 There is still speculation if this is for real or for the deliberate “Dismaland experience”, but fact it you most likely are not going to get online tickets anymore (for the optimists, you can check this link). We arrived on a Sunday around 10.45 (with around 250 people before us in the non-ticketed Q) and ended up standing in the Q until about 15.45. During this day, they let people in in two batches around 11.30 and 15.00 (after the regular ticket holders were admitted for those sessions). At this day, the park was closing at 6pm to prepare for the evening event (ticket holders only), but it left enough time to see and do everything as the park itself is then not too overcrowded and not too big. I am not sure when they’ll let people in on days where they are open until 11pm. 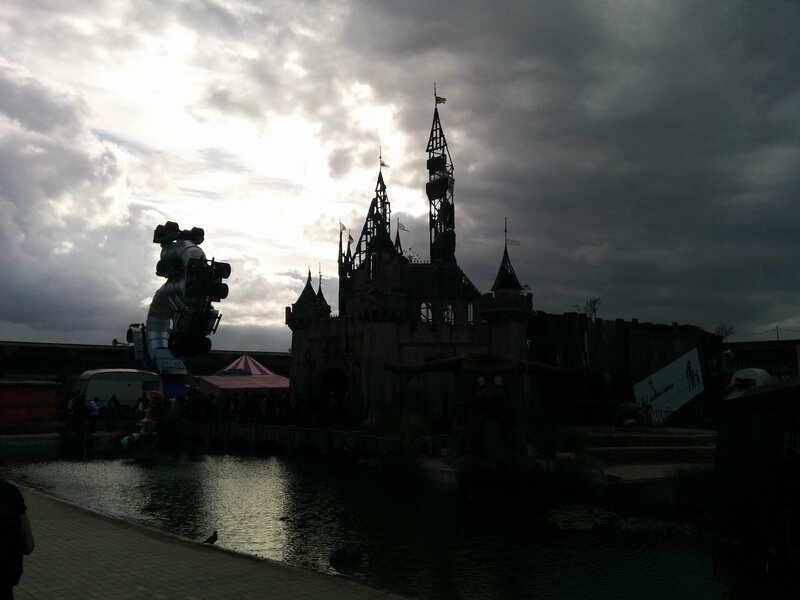 Last but not least, it is Dismaland, so nothing is guaranteed and a little frustration and uncertainty is part of the fun! Online tickets have sold out, so your chance to get in is to get in the Q on the day. 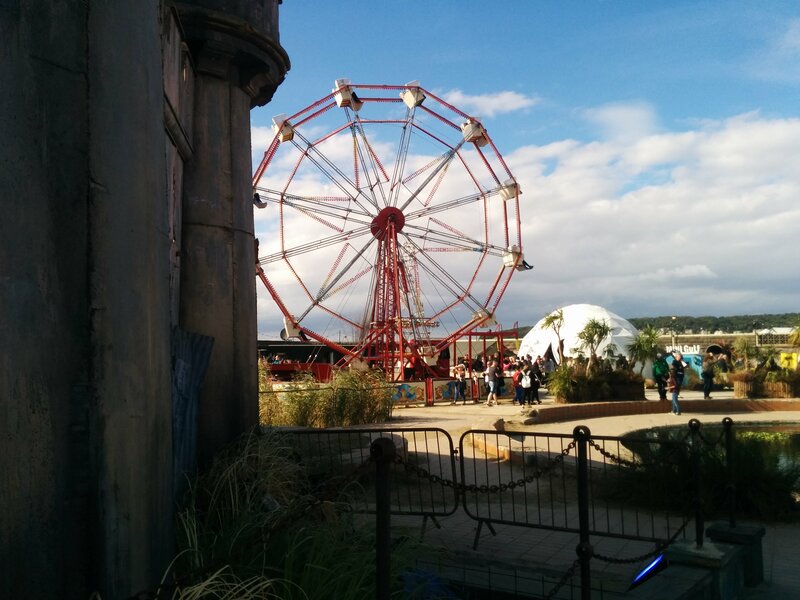 The visit might change you forever – you’ll see the Dismaland in every day life…. 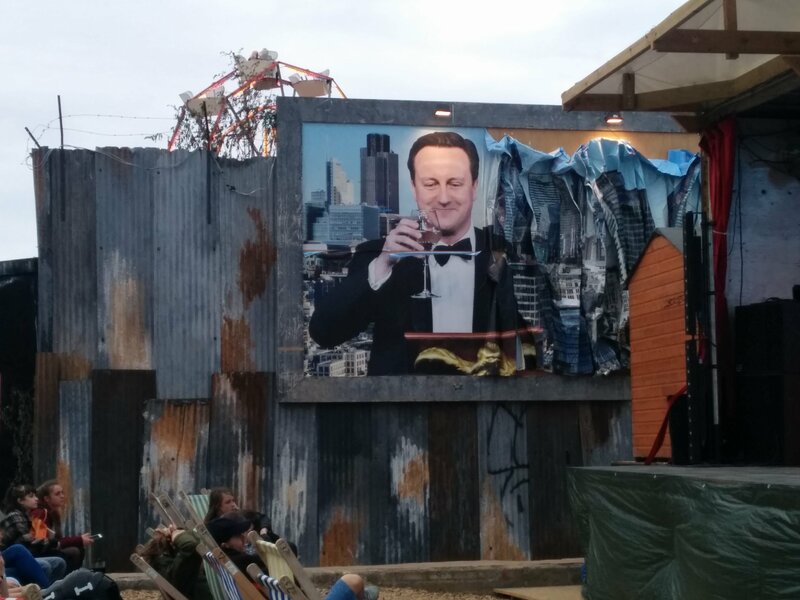 David Cameron is expecting you! ← Get in line! It’s London Open House Weekend!